Image Size: 11"w x 14"h.
Armed with only a lance and carrying no provisions or gear, this Plains warrior is not prepared for a long distance trek but is ranging out on patrol from either his village or encampment to reconnoiter the surrounding area. Does he seek the buffalo, an ancestral enemy or sign of further encroachment of the white man from the east? "I paint these people to raise awareness about their bravery and their troubles,” says Z.S. Liang. He points out that his rural Chinese upbringing was centered on ancient and traditional lifestyles which made it easier for him to relate to the Native Americans. For example, no resources were wasted in his home, much like the Plains Indians who used every part of the buffalo their lives depended on. A long time U.S. resident, Liang has made himself into a student of Native American life, both in his personal library and his time in the field with tribes of today. 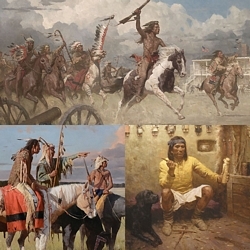 His devotion to historical details and to the constant improvement of his skills, led him to horseback riding lessons so he could more accurately understand the movement and musculature of the animal that played such an important role in the life of the Plains Indian. Z.S. Liang, born in China in 1953 and raised in a family of artists, published his first painting at age 6 in a children’s magazine. His art education spanned two continents, beginning at the Central Academy of Fine Art in Beijing and continuing to the Massachusetts College of Art and Boston University. His award-winning paintings hang in both corporate and private collections around the world and several of his murals are permanently on display in New York City. His works are in corporate and private collections throughout the United States and many other countries, including Sheraton Corporation, Marriott Corporation, Weseda University Tokyo and the West Point Museum. Among the many awards Liang has received are the Best of Show and People’s Choice at the American Society of Portrait Artists, the Arthur Ross Award for Painting at the Classical America New York, and the Lila Acheson Wallace Award for Painting at the Society of American Illustrators. Liang’s paintings have been featured in the Artist’s Magazine and the International Artists.